Thank to everyone who came out this week. Be safe. Thanks to everyone who came out this weekend for the ABA National. Even when LAKE JAKE came by on Friday night and the track held up great. LAKE JAKE Pictures will be posted later. Thanks to every one who helped this weekend. Thanks to Eric Rupe and Mike Day. 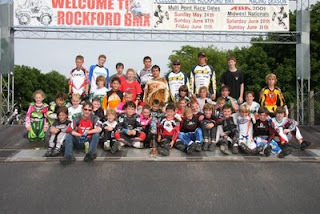 For some great information on racing bmx. I know all the kids had fun. Thanks to everyone who came out for the Race For Life. We gave $3150.00 to The Leukmia & Lymphoma Society. It was a perfect day of racing, Thanks again.